While trying to get sober in a secluded mountain cabin, a drug addict questions his hallucinations of gruesome living corpses. Planning to get sober following another alarming blackout, drug addict Brian Barnes leaves a voicemail asking his friend Anna to join him at the White Deer Mountain cabin he co-owns with his ex-wife Meagan. Brian stops at a general store where he catches the eye of a suspicious cop who follows Brian back to the cabin after a hassling encounter. Brian pops pills found in his car. The cop returns to the cabin to briefly harangue Brian again as Brian begins hallucinating. Brian encounters an undead woman in the cabin’s upstairs bathroom. The vision causes Brian to fall unconscious. After recovering, Brian finds a baggie of cocaine in his sweatshirt pocket. Brian stashes the cocaine in a jar. Brian goes to pick up Anna at the general store. The cop pulls over Brian for another uncomfortable encounter on the way. Anna has an intervention with Brian once they return to the cabin. Brian smashes the jar containing the cocaine and finds a red hair ribbon that he throws in the trash. Anna reminds Brian that their past romance is finished. She also advises Brian to let go of his ex-wife. Anna later comforts Brian after he encounters another ghoul in the kitchen during the night. The next morning, Brian shows Anna that the red ribbon was mysteriously tied around a large knife, which he also throws in the trash. Brian sees the cop watching the cabin from outside. Brian and Anna go for a walk in the woods. Brian sees the ghost of a little girl. Brian tells Anna a story about how he once hit a deer with his car and subsequently hallucinated a man with a deer’s head in his passenger seat. Brian finds the cop’s aviator sunglasses in his kitchen upon returning home. Brian calls the sheriff’s office to complain about the cop, but the cop merely taunts him from the other end. Brian investigates sounds coming from a crawlspace underneath the porch. However, it is unclear what Brian sees. Brian passes out again after seeing a ghoul standing behind Anna in her bedroom. Brian later theorizes that the cop is a killer who uses the cabin when no one is there and the ghosts are the cop’s victims. Brian hallucinates a headless little girl. Brian tries kissing Anna when he turns to her for comfort, but Anna pushes him away. Brian recovers the knife from the trash. Brian also snorts the cocaine. Brian envisions the cop with a deer’s head sitting at the kitchen table. The cop indicates Anna will die. Brian finds Anna missing when he wakes the next morning. The cop shows up with a shotgun and chases Brian through the cabin. Brian ends up killing the cop while also accusing him of being the murderer who killed Anna. Brian abandons the cop’s vehicle at the general store. Brian picks up booze and cleaning supplies before walking back home. Brian finds Anna dying on the floor of the upstairs bathroom. Brian’s ex-wife Meagan unexpectedly arrives with her new boyfriend Todd and Todd’s daughter Alecia, whose hair is tied with a red ribbon. Brian suddenly sees that Anna’s blood disappeared from his body. Meagan vanishes before reappearing in the kitchen wearing different clothes. Believing her to be a hallucination, Brian beats Meagan to death with a bottle following a fight. Brian stabs Todd to death when Todd tries to intervene. Brian then goes upstairs and cuts off Alecia’s head as she tries hiding. Brian wakes in his car back in Los Angeles. Brian leaves the same voicemail for Anna about going to his cabin to get clean. Anna’s decaying corpse is seen in Brian’s trunk. The general store clerk inspects the abandoned sheriff’s vehicle. The camera shows the hatch leading to the cabin’s crawlspace where Brian presumably stashed the other bodies. Drug addict Brian has been down the road to recovery before. Detouring off of it remains just about the only thing he can be counted on to do reliably. This time though, Brian vows a true commitment to getting clean. At least, that’s what he tells his former flame Anna before heading off by himself to the secluded cabin his ex-wife co-owns. Brian isn’t entirely alone for long. Stopping to shop at the roadside store that always cameos in mountain town movies, Brian catches the eye of a country cop who makes it his mission to keep accusatory eyes locked on Brian. Back at the cabin, Brian can’t shake random sightings of ghoulish figures seemingly haunting the woodland home. Are the pills being popped or the cocaine coating his nostrils to blame for the hallucinations? Brian isn’t so certain. The suspicious sheriff keeps hassling Brian at every opportunity, confidently claiming he can come and go from the cabin as he pleases. Aiming to offer a friendly shoulder of support, Anna joins Brian’s struggle for sobriety as an objective eye to tell him which visions are real and which are fantasy. All of these avenues route towards a reveal regarding what’s wrong with Brian’s mind as well as what’s causing the frightening phantoms. “Dry Blood” is a tight-knit affair, the kind limited to a cast that can be counted on one hand and predominantly one indoor location. The people in front of the lens are the same people behind it too, with the director and writer playing the two male leads and the cinematographer playing a lesser role alongside his wife, and everyone being credited as some sort of producer. Of course, there’s nothing wrong with being a scrappy friends and family production. It’s merely of interest to align expectations according to low cost indie standards. 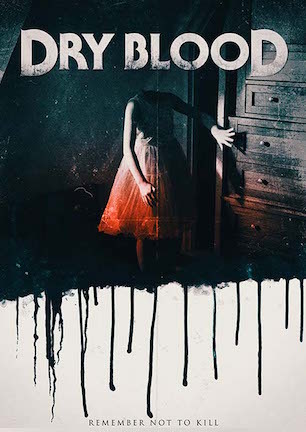 Considering that baseline, “Dry Blood” includes an almost equal number of plusses to its minuses, basically becoming a decidedly average microbudget horror movie. Clint Carney, who plays Brian, provides a script that exemplifies the teeter-totter conflict between beneficial and underserved workmanship. Decent dialogue occasionally rings of being overwritten with a touch too much prose, yet largely fleshes everyone out as believable people. Carney crafts a mystery where hindsight reveals clever clues while clearly intending to examine meaningful themes with honest objectives. He isn’t burping out a carelessly cheap thriller. It’s the wobbly plotting taking too long to identify a direction that heavies eyelids in between action. Establishing Brian’s isolated environment involves watching him chomp shredded wheat, silently check his voicemail messages, pat dust off a dirty chair, take two trips into town for groceries, and other ho-hum hurdles that harm consistency when it comes to engagement. Impatience prompted me to play some dragging scenes on 1.5x and then 2x speed, and I still felt they moved too slowly. Shaky acting docks additional points. Carney’s effort is admirable, although his cracking addict antics come off as comical because he can’t push the personality all the way over the hump of under-experienced acting abilities. Carney’s amplified ugly cry is particularly painful to watch, and not because it is sympathetically heartbreaking. Hyperventilating hysterics hit a similarly grimace-worthy wall. Co-star Jaymie Valentine provides a distraction in the form of strangely styling her hair to look like a wig. I only assume it isn’t because of her wet head in a shower scene. To be blunt though, being unable to stop staring at her scalp becomes a bit of a boon to take eyes away from her acting. I’ve put more passion into choosing potatoes in the produce section than Valentine does in creating a convincingly concerned friend. Director Kelton Jones on the other hand, puts in legitimately fine work as the contemptuous cop. Jones portrays an appropriately annoying, abusive authority figure with near perfect pinches of sneering condescension. I wouldn’t complain about seeing this stereotype so often in other films as long as Kelton Jones was behind the character. He toes the line terrifically between unpredictable threat and ordinary a-hole. “Dry Blood” also boasts several shots of gruesomely bloody effects that would have made fantastic double-page spreads in the halcyon heydays of Gorezone. A few of the deaths look great from initial choreography all the way through camera framing and editing. Makeup work earns a high grade too. In spite of its well-meaning exploration of addiction, “Dry Blood” isn’t something likely to stick in the mind’s eye after it’s over. With a tune-up on the performance front, the movie could probably put another star or two onto its rating. Another polish on the script and pass through the editing room to quicken the pace would have been wise as well. In its actual incarnation as a DTV mind-mystery, “Dry Blood” is here as much as it is there, adding up to a mostly midrange movie. January 21, 2019 by Ian Sedensky.